Final media timeout in first half. Winters' three-pointer gives Washington a 22-21 lead with 3:48 left. UW 22, USC 21. The Huskies take the lead for the first time tonight. They are now outshooting USC 30.8% to 29.6%. Reinhardt leads USC w/ 7. Why hasn't Winters seen more action this season? Seems to have a nice touch. Quevyn Winters with 10 points on 4-for-6 shooting, including two three-pointers. His UW scoring high is 13. USC forward arion Clark comes up limping after hard contact. He's out. UW gets a 5 on 3 break and they immediately take a 3 pt shot. What the heck are they thinking?!? Without Nigel Williams-Goss, Andrew Andrews might be pressing. He's 1 for 7 from the floor and has five points. #SCNotTop10 #SamerDhillon #USC Thought he was being subbed in. No, was asked to help an injured player. Ouch. Silly foul from Jarreau. He should know better. 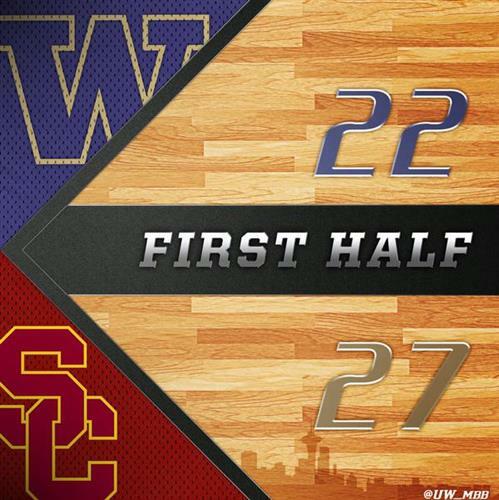 Washington trails USC 27-22 at halftime. Halftime: USC 27, UW 22. USC ends the half with a Malik Martin slam dunk, aided by Julian Jacobs who has 8 rebounds & 6 assists already. Great foul there JJ. Nothing like playing to the level of 6th grade. Sheesh, this is pathetic. At least Romar has all 5 of his timeouts left. BTW, why hasn't Gilles played? Huskies shot 8 of 29 (27.6 percent) from the floor in first half. Trojans were 11 of 35 (31.4 percent). USC leaders at half: Reinhardt (7 pts), Clark (6 pts, 4 reb), Stewart (5 pts, 2 reb), Martin (4 pts, 5 reb) & Jacobs (2 pts, 6 ast, 8 reb). Second half getting started. Same starters for both teams. Going to be interesting to see if shorthanded Huskies can keep pace with Trojans in second half. Andrews doing a little too much. Sloppy turnover led to USC dunk. Washington timeout. Huskies trail 35-24 with 17:05 left. USC 35, UW 24 w/ 17:05 to play…Nikola Jovanovic scores the Trojans’ first 8 points of the second half, culminating in a dunk before the TO. My motto: It's rude not to watch. Media timeout. Washington down 38-27 with 15:47 left. USC 38, UW 27 w/ 15:47 to go…Eight different Trojans are on the board with at least two points each, while just five Huskies have scored. This one is getting away from Washington, which trails 42-27. Only Romar can find a way to get blown out by a USC team. Cellar bound!! It is official. Wort team in school history.